Dubai: British photographer Stu Williamson is “proud” to have won a competition with a shot of Dubai’s Burj Khalifa, and to have seen the iconic building being constructed. 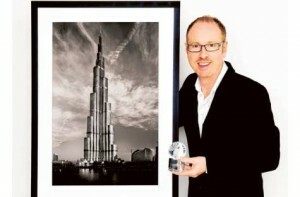 “It’s an iconic building for the world, not only the UAE,” he told Gulf News from his Jumeirah Beach Road studio. Williamson won the Architecture Exterior Photographer of the Year 2010 award, from the Society of Wedding and Portrait Photographers (SWPP) — a UK-based independent photographic organisation. He has already photographed the Dubai Marina Yacht Club, which he describes as a “fantastic” building, and would like to shoot the Emirates Towers, the etisalat building, Meydan and the Burj Al Arab. “Even the Metro stations are quite funky,” he said of the new structures running alongside Shaikh Zayed Road. Williamson first picked up a camera when he was 12 years old, let it go until he was about 18 and then picked it back up again more seriously when he was 21. His father was a “keen amateur” when the family lived in Canada, from where he may have gleaned inspiration for the art form. Now he is passing on that inspiration to the next generation – his six-year-old son has also shown an interest in his father’s profession. “He’s been brought up with it, so it’s second nature to him, I think,” Williamson said. The photographer moved his family and business to Dubai five years ago, moving from the small town of Market Harborough in the British Midlands. While he specialises in black and white classic portraiture, his business also has a dedicated school division and takes on commercial work. One of the main pitfalls that photographers have when working is planning, Williamson said. “You have to plan it out, then work to that plan. I think this is the thing that most photographers forget — they’re impatient,” he said. The black and white image of the Burj Khalifa was taken during the winter; during the summer months the sunlight is too bright, there’s a plain blue sky and there would be too much reflection so the shot “wouldn’t work”. Williamson said there was no modification done to the picture and because there’s no digital enhancement, it gives the picture an old flavour. “What I’m doing is, I’m actually shooting art,” he said. “It’s a beautiful building”.